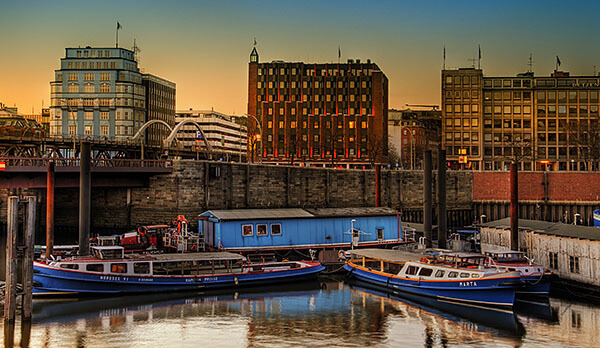 In 1189, Germany’s Emperor Frederick Barbarossa granted the growing city of Hamburg an important charter: They could hold markets in the city, and ships could travel customs-free along the lower Elbe River to the North Sea. Signed on May 7, 1189, this charter set the stage for the development of what is today, more than 800 years later, one of Europe’s busiest ports and the largest in Germany. Recognizing the importance of this port, in 1977 city organizers created Hafengeburtstag or the Hamburg Port Anniversary. For several days each May, more than one million visitors descend upon Hamburg to celebrate the birth of the harbor and the city’s naval history. Tall Ships, cruise ships and tugboats, oh my! As has been the tradition since the festival began, the festivities will kick off on opening day with the Grand Arrival Parade. This parade of more than 300 vessels will cruise along the Elbe, led by the German Navy sail-training ship the Gorch Fock. Among the ships arriving will include some of the grandest tall ships from around the world, including the Cisne Branco that is sailing to Hamburg all the way from Rio de Janeiro, Brazil for the festival. The majestic tall ships won’t be the largest ships to join the parade. Thirteen cruise ships will also make the journey to Hamburg, including the Fram from Norway and several German cruise ships like the MS Deutschland. And while she won’t be a part of the Grand Arrival Parade, the Queen Mary 2 will arrive in Hamburg for a 12-hour stay on the last day of the festival. Visitors won’t be limited to viewing the ships from the sidelines. Almost all of the ships participating in Hafengeburstag will be open to visitors, who can explore the ships and catch a glimpse of what life is like on the open sea. Among the most popular Hafengeburstag events is the Tugboat Ballet. Similar to other events held around the world (Seattle and Sydney also host water-based ballets), this humorous and entertaining show features the generally ungraceful tugboats maneuvering around the harbor in time to classical music. For those who want something more fast-paced than the slow-moving tugboats, the festival also offers events for the more adventurous — as well as the smallest attendees. Along the festival promenade, which extends from Kehrwiederspitze to the Fish Auction Hall, attendees will find amusement rides as well as nearly 500 stalls selling food, handcrafts and other items. Buy a ticket for a hot air balloon ride or helicopter tour for a bird’s eye view of the harbor and the city of Hamburg. Or, take in one of several planned live music shows on stages throughout the festival area. A celebration isn‘t complete without food, and the Hafengeburstag has something for everyone in the gastronomic delights category. For 2013, the festival has partnered with Italy to present a taste of la dolce vita — the sweet life — for the festival goers. Highlighting the Liguria region of Italy, organizers plan to open several small trattorias where visitors can grab a bite to eat as well as taste wines from this northwestern coastal area. Of course, traditional German fare will be easy to find; given the nautical focus of the festival, expect plenty of seafood as well as street food favorites like curry wurst, a traditional German bratwurst coated in a curry-flavored ketchup sauce. Kebabs are also a popular treat among festival-goers, reflecting the influence of Germany’s large Turkish population. Whether you’re there for the tall ships, the fireworks or the food, Hamburg’s Hafengeburstag is one of the city’s biggest celebrations and offers a good time for all ages. It’s not every day you celebrate an 824th birthday. About the Author: A native New Yorker, Sabrina Kurth traveled to Germany as a child to visit relatives living near Hamburg — and they brought her to Hafengeburstag to watch the tugboat ballet. Now a travel writer, she returns as often as possible. If you want to catch this year’s festivities, she suggests you click here to search for hotels in Hamburg. Last updated by jack on 22 April, 2013 in Destinations.